My computer has not been working- it is torture to write one simple email because it takes FOREVER to boot up and can hardly handle logging onto Internet Explorer. I know that if I loaded my SD card from my camera onto it, it might combust. So, yes, I have been doing LOTS of sewing- but all the posts are going to have to wait till Nick comes for a visit next weekend. I will use his laptop to get my pictures onto here and schedule a bunch of posts. I was able to get this picture off a Flickr post, it's from the Bend the Rules Swap. People from all over the U.S. signed up to make one of these "Charming Handbags" from the Bend the Rules Sewing book. 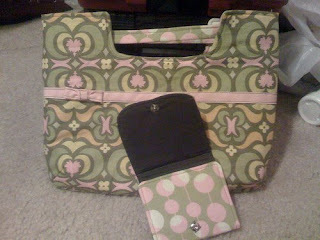 This is a picture of the bag and "cashless wallet" I received from Jodi in Texas. She did an awesome job- it felt like Christmas when the package arrived.